Wolves are the largest members of the Family Canidae. The wolf has a large head with a wide forehead, powerful jaws, bone-crushing teeth, and long, blunt muzzle. Its ears are short and triangular in shape. The neck is thick and muscular, particularly in the male; the limbs are long and powerful. It carries its head down at the same height as its back unless at attention, when it raises its head. The back slopes downward toward the tail, which is long and bushy. They have a thick coat with a wooly underfur and straight, coarse guard hairs. Wolves in higher latitudes have a thinner coat than those living in cold climates. Wolves vary tremendously in size from one region to the next, and males are usually larger than females. The Arabian wolf is smaller than the European and North American wolf, but about the same size or larger than the Indian wolf. The weight of an Arabian wolf averages 25 kg (55 lb). Arabian wolves will hunt small to medium sized animals such as rodents, hares, small gazelles, and small ibexes, although they will feed on carrion and livestock when in the vicinity of human settlements. Arabian Wolves will attack and eat any domestic animal the size of a goat or smaller. 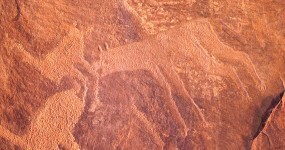 Although our team has encountered wolf footprints and has seen a slaughtered wolf strung up in a tree, their depictions in petroglyphs are quite rare. Wolves are extremely adaptable, able to thrive from the frozen tundra of the Arctic to the extreme deserts of Arabia, as well as in savanna-grasslands, montane regions, forests, and more. 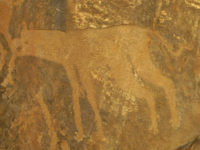 The wolf was once second only to the lion in terms of its nearly global distribution, covering much of Europe, Asia, the Arabian Peninsula, and North America. Today, however, its distribution has declined to less than 1/3rd its original range, with relict populations sprinkled over Europe, Asia, Arabia, and North America. The Arabian Wolf was once found throughout the Near East and the Arabian Peninsula, but now can only be seen in small pockets in southern Israel, southern and western Iraq, Oman, Yemen, Jordan and Saudi Arabia. It is still widely dispersed across the Arabian Peninsula, although it may not penetrate the deepest parts of the Rub’ al-Khali and other extremely arid regions. Their numbers have plummeted in the last half-century, and they have vanished from many parts of their original range. Because they prey on domestic animals, the owners of livestock poison, shoot, or trap the wolves to protect their property. Habitat loss from industry and intensive agriculture has also become a significant threat to the Arabian Wolf. There are an estimated 2000-3000 Arabian Wolves remaining in the wild.